Is there somebody in your family who is absolutely impossible to buy for? You know the one. It's the person who doesn't need much, or who is tight-lipped as to what he wants, the person who has got a whole bunch of stuff already. Such people are almost impossible to buy for. Well, if you've been wrestling for a perfect gift, I can help you out. I've found the perfect, one-of-a-kind present. The gift is at Tanaka Kikinzoku jewelry store in downtown Tokyo. The gift is a revolving, eight-foot-tall tree decorated with fifty Disney characters like Mickey Mouse, Tinker Bell and Cinderella. Sound good? I'm glad you like it, but the best is yet to come. 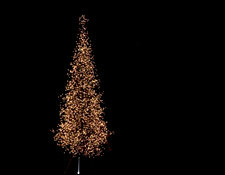 The best is this: the tree is made of 88 pounds of pure gold. The price tag is only 350 million yen. (That's $4.2 million.) Now I know what you're thinking. You're thinking that's ridiculous! Nobody would pay that kind of money for such a present. Frankly, I agree. So does the jewelry store. They've got a smaller tree with only 20 Disney characters. You can snap up that one for a bargain two million yen ($243,000). So what do you think now? Is that the perfect gift or not? Did you say, "Nope, that gift isn't for me" Or were you one of the practical ones who said, "Sure, I'll take it, melt it down and get the cash?" No matter which group you were in, a gold tree is hardly a perfect gift. It may be an expensive gift, a beautiful gift, a unique gift, but it's not the gift we need. To find that gift, we, like the Magi, like the shepherds, need to go to Bethlehem. There in a manger or in a house we will see God's great Gift to all of us: His Son. Wrapped in swaddling clothes, He may not look like much, but He is the Redeemer of the world. In the short life which is before Him, He will live a perfect life for us. He will resist temptation for us. He will fulfill the commandments for us. He will carry our sins for us, and for us He will die. His will be a one-of-a-kind gift, one which can never be copied. And, dear readers, Jesus is the one Gift which we need. When that Gift becomes ours through Spirit-given faith, our sins are forgiven, and we are granted a new home in heaven. There we shall live forever, giving thanks for God's perfect Gift -- the Gift better than gold. THE PRAYER: Dear Lord, as we go searching for the perfect gift for friends and family members, may we remember that -- by Your grace -- we have received the perfect Gift of a Savior and blood-bought salvation. May we share that Gift with others. In His Name. Amen.